It seems the fall season is upon us. Even though as I write this article it is over 90 degrees out and all of us are just waiting for the next break in the weather to get fired up about deer season and all of the magic that comes along with fall. All of the preparation is complete. The food plots are all planted and growing much better than last year. We have our deer stand up and ready to hunt. Now all we must do is get more practice with the bow and before we know it we will be sitting in a stand waiting for a monster to come by. This year has a special meaning to it for me. This will be the first year that my baby girl will accompany me to the stand with the thoughts of harvesting her first deer. We have been practicing with the crossbow and she has it dialed in. Now all she must do is control that adrenaline and hopefully she will be able to put some food on the table for her family. I am sure all of her friends at school and her teachers are wondering what the heck is happening. She is so excited to go hunting she is continually talking about getting her first deer to feed her family this winter. To say I am a proud dad is an understatement. It seems as I get older the hunts mean a lot more to me when I can share it with a kid. It is something we should all make sure we do. There are many kids out there that would love to go hunting for the first time, but they don’t have a mentor to show them the ropes. There is nothing more satisfying then teaching a kid to hunt or fish. The smiles they get when they catch a fish or see the ducks dropping into the decoys or the deer walking 20 yards from your stand there is nothing in this world that gives you that type of adrenaline rush. At least not for me. I challenge everyone to find a neighbor kid or a niece or nephew. I guarantee it will be the most pleasurable experience when you help them find their passion for the outdoors. So, take a little time and think about a kid that you could take fishing or hunting and make that a goal for you this season is to take someone new fishing or hunting with you. 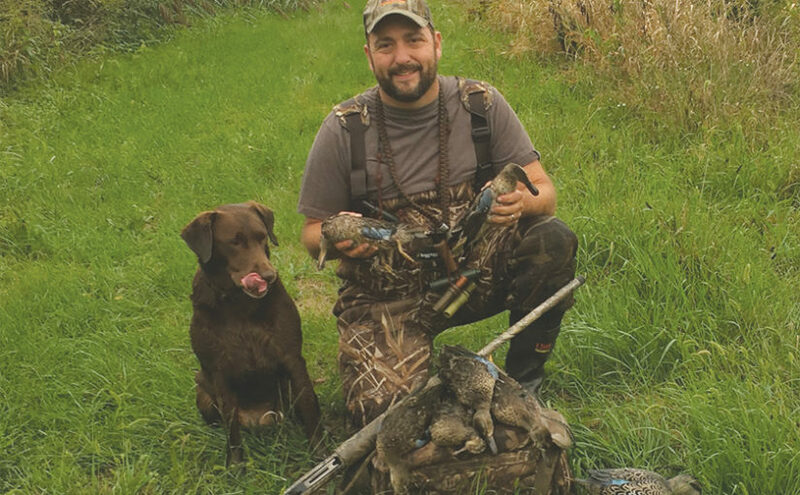 As September 8th rolled around I was ready to try my hand at some teal hunting. We usually don’t get many teal at our club but I always like to get out with the dog before we head to North Dakota. It was a perfect morning for opening day of teal season. The temperature was beautiful and it was a little cloudy. As we walked up onto our spot we decided to hunt we kicked a couple dozen blue winged teal. As we set our decoys it wasn’t long before the first couple missiles come right too our decoys. Two shots later both were on the water. As the day progressed we picked of one or two here and there until we had 6 total between Al and I. Since the first day was pretty good we tried our luck on Sunday but we only we able to harvest two. It was a great first hunt of the year. Cocoa was able to make a few retrieves and now we wait for the great trip north. I was going through a little fishing withdrawal a couple of weeks ago and all of my friends were working, and the weekends were spent getting the final touches on deer stands and duck blinds. I saw a friend of mine Reagan Smith with Reag’s Guide Service was catching some fish, so I thought I would drop him a line. Sure, enough he was available that Friday. The only issue with that date was it was going to rain there was no doubt about it. He asked if I would be willing to go fishing in the rain and I said let me know where to meet you and what time and we will give it a go. Friday morning arrived, and I meet Reagan in Tremont and we headed to Lake Springfield for a little white bass fishing. I have never been to Lake Springfield, but I did know that Reagan seemed to do quite well on this lake even in adverse conditions. As we arrived at the boat ramp there was a slight drizzle. Nothing to be to worry about. We backed in the boat and off we went. We arrived at our first spot and it didn’t take long and we had a couple on the boat. I was actually amazed that we were catching as many fish as we were considering it had been raining for several days. The water was up the water was dirty, but Reagan knows that lake like the back of his hands and he consistently put us on fish. On many trips Reagan catches more than 100 fish per day somedays double that or more. He has a real knack for the white bass and the crappie. Our goal this day was to boat a few fish for a fish fry Reagan was having at his church. As we moved from location to location each spot seem to get us a few more fish. At one-point Reagan pulls in a small catfish and I was a little surprised he was catching catfish on this blade bait. It wasn’t more than five minutes later I caught a catfish and a few minutes later a nice largemouth bass. We were having a blast. We didn’t seem to mind the rain we had our gear on and were semi dry. I did realize that I may need some new rain gear. By the time we got back to the ramp it didn’t look like I had a jacket on. Reagan and I had a great time fishing and sharing stories and just enjoying each other’s company. I really recommend him to anyone looking to have a great day on the water. For all of the outdoorsman out there who work all week and only have time to fish in the weekend I would highly recommend taking a guide. If you time is limited, and you want to catch fish then a guide is the way to go. Most guides are very reasonable with their pricing. They provide the boat, bait, gas and more all you must do is show up to the dock and your ready to go. This has so many advantages. First you don’t have to worry about getting your boat and gear ready the day before. You don’t have to worry about going to get bait or what location you are going to fish. You just show up jump in a boat, the guide will take to prime locations and put you on fish and when your all done most guides clean your fish. There are so many great guides out there and many are in this magazine. You can find a guide for any fish you would like to catch. If you would like to fish on Clinton Lake or Lake Springfield, then give Reag’s Guide Service a call. If your wanting to fish for crappie, sauger or walleye on Lake Shelbyville then give England Expeditions a call. Looking for toothy critters like Muskie give Predator Guide Service a call. The list goes on and on. We have several great guides from Wisconsin and Minnesota so if your looking to take an adventure outside of Illinois there is plenty of those to. If you love fishing for giant striper you can call STR Outfitters out of Mountain Home Arkansas a call and they will put you on some amazing fishing. So, the next time you are thinking about going fishing take a little time to do some research on different guides and give that a try. I know every time we use a guide I am not disappointed. With hunting season around here just around the corner and really nothing left to do but get ready to hunt it is time for me to prepare for our annual trip to North Dakota. We have been going to the same place for 9 years now but we decided is was time to make a change. Instead of driving 11 ½ hours we have decided to add on to our trip and drive and additional 2 ½ hours to try new territory in North Central North Dakota. I love to hunt duck I just don’t like the long drive to get there but if you want to have a great week of duck hunting sometimes you have to go that extra mile. From everyone we have talked to it is a little different hunting up there. We always hunted the south east corner of the state and most of that was sloughs with cattails and not easy walking. Farther north they say is more cow pasture and pot holes. As long as there is water we should be fine. Where we usually go in North Dakota just doesn’t have the water we once did. When we started going 9 years ago there was water in every field. The second year we arrived there was not one piece of water that we hunted the year before that was even there. Now every year since our first year the water has been less and less. Many of our places that we have harvested ducks are no longer in existence. Many of the areas that weren’t able to be farmed are now all tiled and growing crops. It amazes me how much water we lose each year. Things seem to change with time so it is time for us to try something new. Besides we will have a great time no matter what happens.